Young children and babies are natural scientists and are constantly trying to understand the world around them by actively exploring, discovering and asking questions. This innate curiosity is fostered in two new programs designed for pre-schoolers and babies that are created and delivered by experts in early childhood science education. Banksia Buddies targets children aged 2-5 years. Each session comprises an engaging presentation involving interactive stories, songs and science demonstrations followed by free play with hands-on activities, art and craft related to science and nature that are delivered in the beautiful setting of Centennial Park. Session themes change each week. Poo Detectives! Children learn about food chains and discover what the animals of Centennial Park eat by looking at the unmentionable! Come and hold 100 million year old fossil dinosaur poo, make a scratch and sniff painting and role-play with a food market. Who knew you could learn so much from dissecting a sterilised owl pellet! Weather and Kites! Children witness a cloud made in a bottle, sculpt clouds using shaving cream and make and decorate their own kites to fly in the park. Warning: After all the running and kite flying the children will be exhausted! Where: Opposite the café in Banksia Way, Centennial Park. 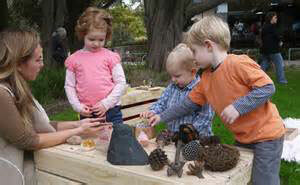 Banksia Babies gets children engaged with nature from their very early years – as babes in arms. If you placed a collection of plastic baby toys in one bag and some natural items such as a pine cone, vegetable brush, sea shell, orange, metal whisk, sponge etc. in another bag, which bag do you think would feel the most interesting? A collection of natural items offers a greater range of textures and smells for babies to explore. Sensing all the contrasting states, textures, smells, weights, temperatures and sounds encourages language use and concept formation. Science is simply about exploring and discovering. All children are naturally curious and babies are exploring cause and effect, for example, when they bang something together and it makes a noise or when they drop something off their high chair and you pick it up, again and again…and again! After a lot of repetition babies may start to gain an understanding of the world around them. We hope after attending a Banksia Babies session that parents will be inspired to start making their own nature treasure baskets for their babies, using things collected from the bush, the beach, the garden or around the house. These baskets are often are collection of memories from all the places you have been. Banksia Babies is suitable for parents with mobile babies and toddlers (9 months to 2 years). When: 9:30am, 10:30 am and 11:30 am Mondays 13 & 20 July, Wednesday 15 & 22 July & Friday 24 and 31 July. Cordelia Hough is a Science Communication specialist and early learning education with a passion for nature play.